Fashion is a EUR 1.3 trillion industry, employing over 60 million people. It is easily one of the largest industries in the world, which also makes it one of the most resource intensive, reading environmental challenges that are a major threat to the planet and the long-term success of the industry. Enter, Global Fashion Agenda (GFA), the industry's Mr. Miyagi of sustainable business practices. 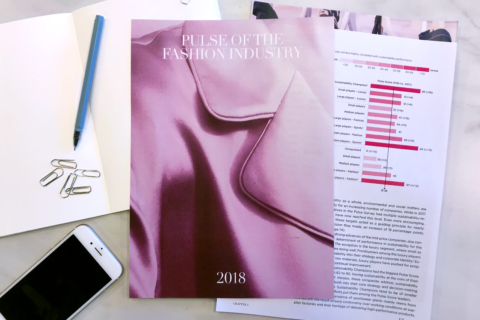 GFA's mission is to "mobilize the global fashion system to change the way we produce, market and consume fashion, for a world beyond next season". In short, they are mentoring the fashion world out of this mess by facilitating solution sharing, and collecting and spreading insights so decision makers can actually implement change. GFA gets all the major players together each year for a summit to discuss the hot topic of sustainability and then publishes an annual report called The Pulse of the Industry. WWD summarizes this 124 page report in one headline "Sustainability in Fashion is Growing, but 'Systemic' Change a Ways Off". Ways off. While the ball is rolling, it's more like that of a novice bowler...a sluggish roll that most likely ends up stagnant in the middle of the lane. We were happy to learn efficient water use and supply chain traceability have improved over the last year, however raw materials are still the biggest challenge facing the industry (i.e. continuing to use non-renewable resources and simultaneously overproducing clothes). Waste is another big concern, one we're very passionate about too. Companies like Nike Inc., Hugo Boss and Inditex made notable efforts to cut back on material waste, but the overall score of the industry is still at 38 out of 100. That's like an F and out high school self would have been grounded for life. Lastly, GFA's report urged fashion companies to 'join forces with suppliers, investors, regulators, non-governmental organizations, academia and consumers to create an ecosystem that supports transformational innovation and disruptive business models," especially around raw materials and end-of-use issues. End-of-use (clothing disposal) is a natural part of a person's wardrobe lifecycle, but at Tulerie we're hoping the "use" part of the equation is maximized by embracing closet sharing so we are contributing less at the end. Dare to share. Read the full WWD article to learn more about the GFA's findings or the full GFA report here.